And yes, I got to share the screen with him. Alright, I'll be honest, not quite like you think. I live near Nashville, Tennessee, and I do act from time-to-time. I watch the casting calls for Still the King and Nashville on CMT. I don't get cast often, but I finally did on Valentine's Day! They needed a large crowd of paid extras for Still the King, and I got it! It was a country/western concert, and they asked us to come dressed in something country-like and with our hair and make-up already done, and two alternate outfits just in case the costume department didn't like what we were wearing. I don't have a lot of cowgirl getup stuff, I'll be honest. Putting together an outfit was not easy, since my style is more pinup and cosmopolitan. I arrived at SkyWay Studios in Nashville a few minutes early, and once I cleared the front gate, they let me in. I went to the extras holding area, basically one giant green room for people who don't get lines and are basically scenery. The guy who was directing us was a bit frazzled, but that was mostly because there were so many extras! I don't blame him for being stressed out, that job had to be super-stressful! While I was waiting, I had to fill out paperwork and make a copy of my driver's license for the film company. After I filled that out, they sent me down the hall to the open sound stage where I had to check-in with wardrobe and let them evaluate my outfit. 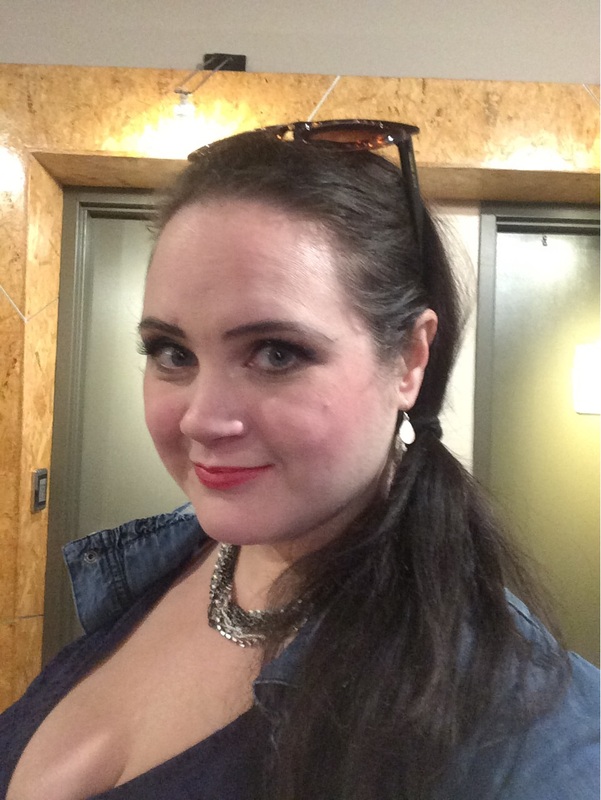 I wore a navy blue dress with a chambray denim jacket top and 3/4 lace leggings and black booties. A lot of the extras had to film outside or were bussed to different locations, so I was hoping I'd be prepared. Today, it was about 55 degrees out and falling. The costume people liked my dress but asked to see the black cardigan I brought. I offered to try out the different outfits I brought with me, which were jeans and different tops, mostly, but they said that changing out of the chambray top to the black cardi would do just fine. After this, I got in line for make-up and hair. I had straightened my hair out and done my own make-up, and the hair woman looked at me, and ran a brush through my hair before pinning one side back. Then, the make-up lady looked and me and said she didn't even need to touch my make-up, it was fine. Good for all the time I spend studying Youtube tutorials, right? So, we left our suitcases (a lot of people packed suitcases with their clothes for today's shoot), and went on back to the extras holding area. 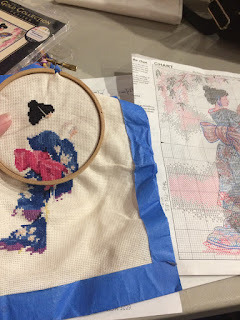 I brought my cross stitch along and some Keto foods. There was a craft foods station (aka snack table) with all kinds of carbohydrate-rich goodies. I didn't eat them. Since the call said that we weren't supposed to use our phones in the building, I kept mine in my purse for a while, but then noticed most of the extras entertaining themselves with Facebook and Instagram. I didn't want to drain my phone's battery, so I focused on cross stitch. I got so much done today! I chatted with some of the other extras, although there was that stereotypical small-talk girl who bragged about the different jobs she had in the area and that she was going to Atlanta for more jobs there. I mentally rolled my eyes and dove into my needlepoint. There were a few moments when the extras director was doing some kind of work by radio from the extras holding area for a sound stage. I tried to stay quiet while he did it, since sound can bleed over into the stage. The extras director then stood up on a chair and told us what the scene was going to be about: Verne, the Billy Ray Cyrus character on the show, was having a storyline in this episode where someone was playing him in a movie being made about his life. Actor Vern and Actor Trayne were supposed to get into a fight on the concert stage, and Still the King Vern (Billy Ray Cyrus) was going to come out and pull the plug on the production because Actor Vern (John Corbett ::swoon::) was playing him like a whiney baby. So, we waited for that portion to come up for filming. We waited. And the people called to be security guards, play the part of the film crew for the production, the executives, and the prostitutes were coming in and out, their scenes called. Finally, at like 6, we got called in. There were about 200 of us for the audience scene, and we had to wait in the hallway while the stage was prepared with pretend musicians and the actors were prepared. While waiting, we were asked to be quiet (most of the extras were anything but), and I saw at least two people directly in front of me using their phones. When we got in, I was on stage left of a T-shaped concert stage on the sound stage. The actors playing Train and Vern in the movie in Still the King came out for some final rehearsal, and one looked like a normal guy, the other one had a mullet wig on and an Abe Lincoln beard. 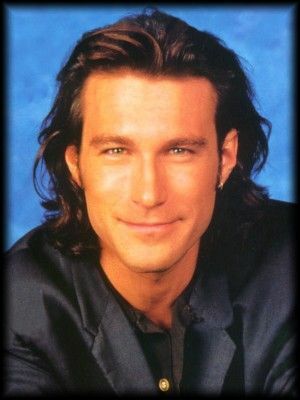 I looked again and, OMG, it was JOHN CORBETT! I could see he's still really handsome under the cheesy wig and beard. No joke! Swoon! I felt like shouting "Aurea Visya!" in Greek at him to see if he remembered that classic line. But, I refrained, since it's kind of a lewd comment and I was there to do a job, not crack gross jokes. The last thing I want to do is get blacklisted from getting cast again. So, we watched as they did a few rehearsals, and we were told to clap and dance along like we were at a concert (only silently), and then stop and react when they got into a fight at the end of the stage. They were going to add in the crowd cheering while editing after filming, better known as 'ADR'. The actors on stage had to adjust themselves so that they read correctly in the camera, and we watched as they did a few rehearsals. Billy Ray Cyrus came out at the end of the scene, and told them to stop this whole thing, calling cut, and then yanked some heavy cords apart, sending the sound stage into darkness. The first time Billy Ray did it, he accidentally had the heavy male end of the cord fly into the audience and the woman beside me almost got smacked in the face. Billy Ray was so embarrassed, he was immediately concerned for her, which was nice. She was fine, but he said that his ears were burning. See? Big-name actors and musicians can be classy people. There were a lot of cursing, and I wondered if the cursing was bleeped out on CMT. John Corbett flubbed his line in one take (but was so charming and funny), had tons of questions for the director, and we had to retake a few times, but not too many. We were done within an hour and a half. But I was paid $57! Not bad, huh? He was wearing a wig and fake beard, so I couldn't tell about his hair. Either way is fine with me, John Corbett!! I kid, I know he's in a serious long-term relationship. I actually had a good time and basically got paid to cross stitch. Not bad, huh? I wanna do it again! A few days later, I got cast as an audience member on Nashville, where I got to play a Juliette Barnes fan at her comeback concert (Season 5 Episode 13). I got to go to another soundstage and be hearded like cattle (another case of me joking, I swear.. please cast me again!) because it's dangerous for extras to roam the soundstages unattended, so they had to contain us to a certain area. The set was set up like the backstage of Bridgestone Area, complete with food that looked fresh, but had been there for over a year (don't touch it! YUCK!! ), and I screamed my head off for Hayden Panettiere to come down from the heavens like a goddess when the cameras were rolling. No ADR here (Additional Dialogue Recording) unfortunately, they used us as the actual sound of the crowd. I was hoarse as hell on the way home and the next day. I don't know if Hayden is a nice person personally, but she is tiny and very pretty and was very nice to us extras and thanked us for doing what we did. That was very classy, and I have respect for actors that are nice to extras like that. No, I didn't try to talk to her, she was working, and so was I. It's called 'being a professional.' She dashed right by me with her assistant at one point, though, and she had to wear high heels with no platform under the ball of her feet, and she was limping between takes, grimacing after a few minutes. But when the cameras were rolling, she didn't show the pain at all. When they were filming her from the waist up, she came out in comfy-looking fake-fur boots, though. And there was a blonde girl in similar sparkly dress as her double who stood in for her when they were shooting us and the gospel choir behind Juliette. Even actors need a break, according to SAG laws, so they let her rest when they were taking shots of the rest of the concert (that is perfectly fine by me, not a complaint, I get why they do that). My feet were killing me by the end of the scene too, not gonna lie. We were standing here for about three and a half hours. Those sound stages are built on concrete slabs with no real padding (which makes setting up the camera dolliess easier, but you could tell the newbie extras in the crowd who had worn heels that were dying). But it was worth it. I can dream about being a big star on TV or in the movies, right? Whenever I get onto the set, I remember why I love acting: it gives me empathy for different events and things that can happen to people and opens up my world view. I only wish I could do more of it to help others open their hearts, as well. And that's why I love doing it. I really do want to act more acting from here on out!